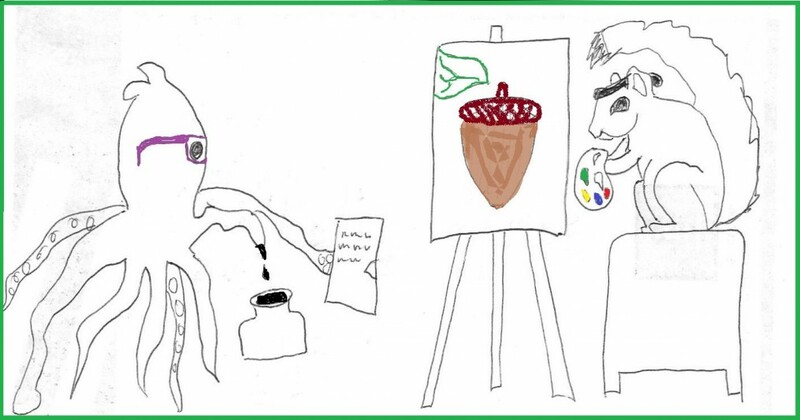 I am always excited to find new talent in our local art scene. Young artists with passion and perseverance inspire and amaze me. Twenty one year old Allison Wier is one such artist. A native of the flat state of Michigan, Allison moved to the Pacific Northwest (Sandpoint, ID) to live near the mountains, enjoy nature and the abundant wildlife. These are the things from which she finds inspiration. Allison enjoys many artistic outlets / mediums. She’s sculpted with everything from pipe cleaners to clay, painted with water colors and acrylics, and drawn with pastels, colored pencils and the occasional charcoal. But that’s not all. I asked Allison which medium she enjoyed the most. Her response? 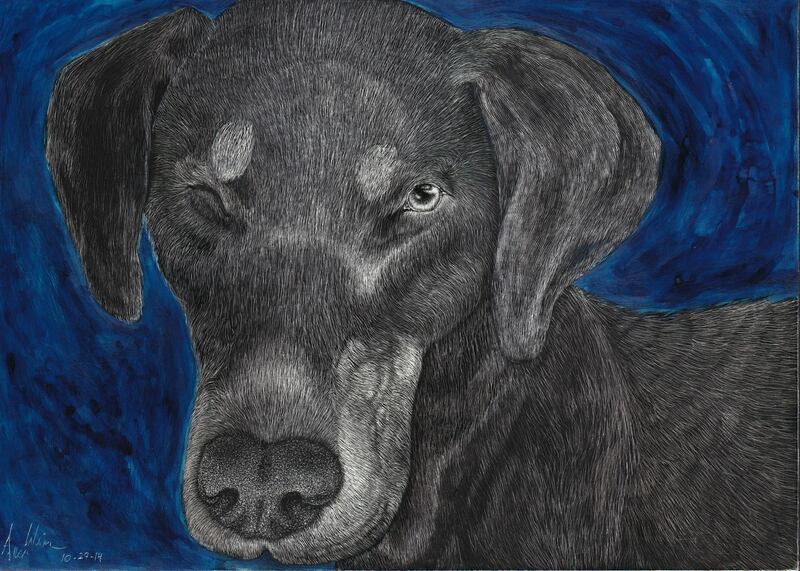 “I love scratchboards. I enjoy using light to create shadow”. As you can see, her enjoyment of this medium shines through. Always considering herself an amateur artist, it was only a few years ago that her friend Mary gave her a box of colored pencils and told her to try making a living at it, to be a professional. 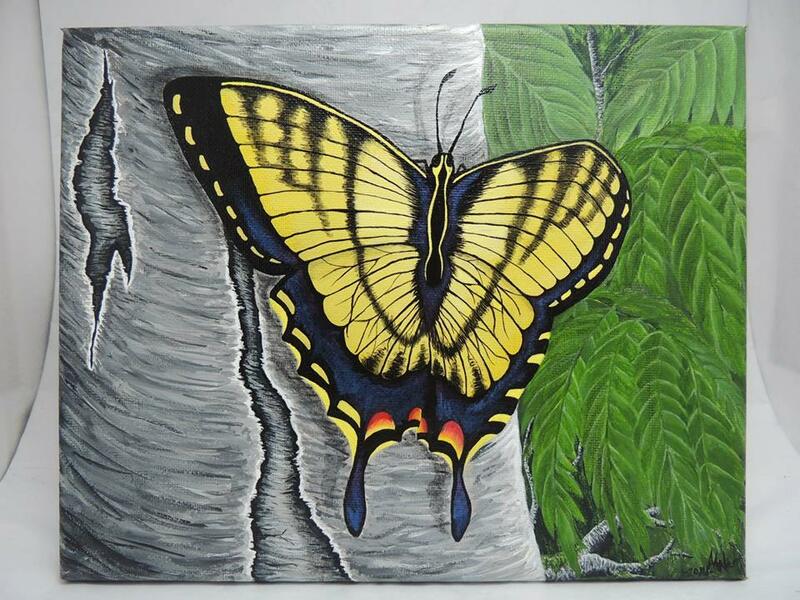 Allison re-did the piece, now called “Butterfly on Birch #2” and the customer was thrilled. 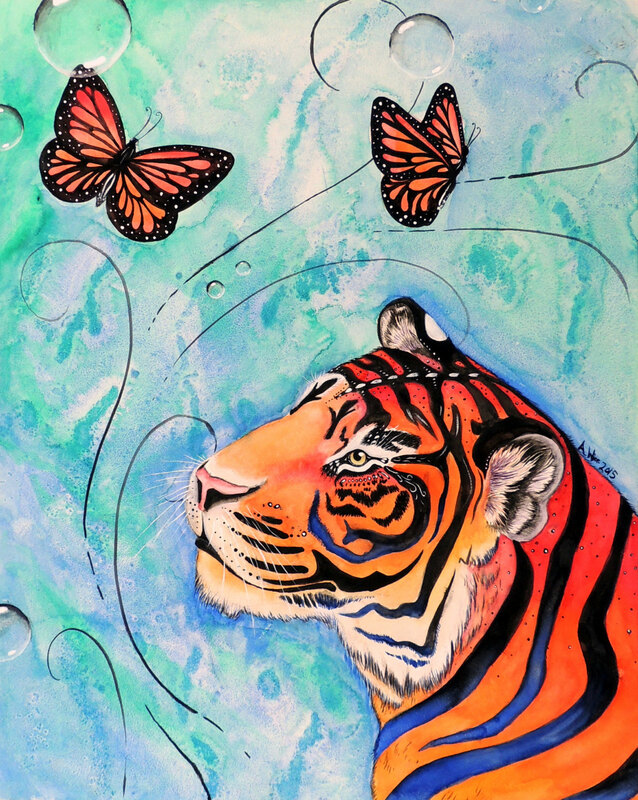 Since then, Allison and her best friend and fellow artist Mary have created many amazing works of art, including an entire butterfly series, and opened on-line studios on both Etsy and Facebook. (Links to both can be found at the end of this article.) She now credits Mary for making a great investment by purchasing those pencils for her. When asked about her process, Allison told me that she likes to travel around, whether on foot or bike and take pictures of anything that catches her eye. She saves the photos in a folder on her computer to use as inspiration later. Many of the photos are based in nature, especially the flora and fauna surrounding Sandpoint. Together with her friend Mary, these two young artists have logged many miles and hours exploring the amazing country surrounding them. Beyond using her pictures for inspiration, Allison has also brought natural elements into her art, recently painting her first shelf fungi. 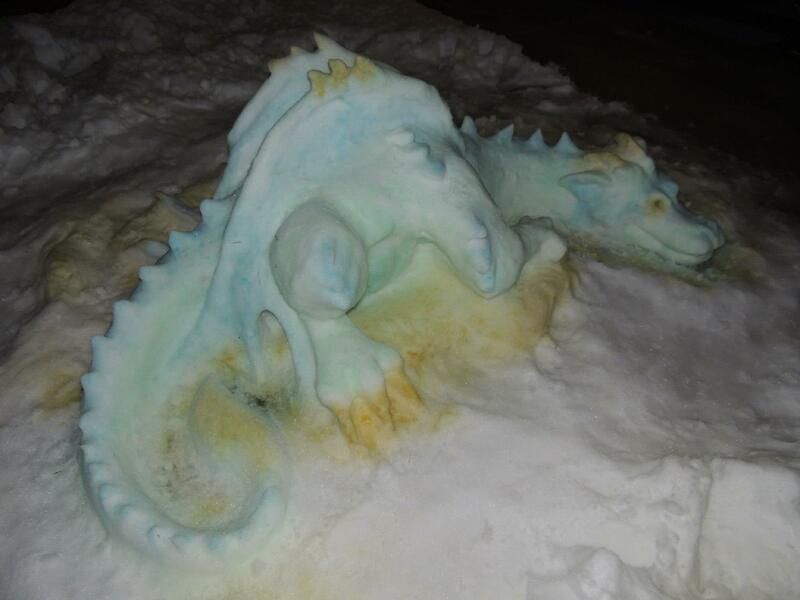 She also enjoys a family tradition of snow sculpting. 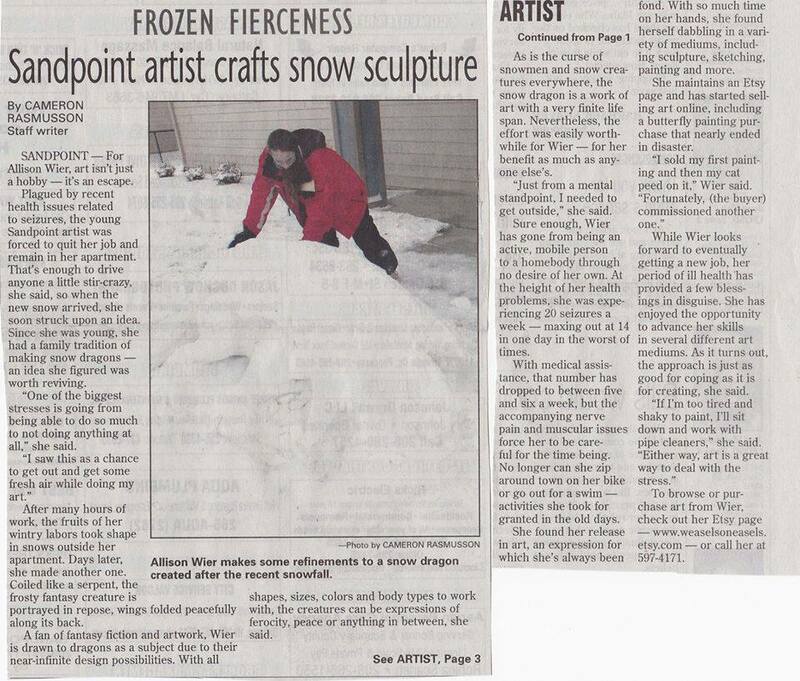 One of her snow sculptures caught the eye of a local news reporter and was featured in The Daily Bee in January of 2014. I met Allison through my Lupus Support Group. She called after suffering a bad bicycle accident that caused swelling in her brain, which in turn, caused her to have seizures and painful muscle spasms. After many hospitalizations and new health issues surfacing she was officially diagnosed with Systemic Lupus, Fibromyalgia and Ehlers-Danlos syndrome (a group of inherited disorders that mostly affect the skin, joints, and blood vessels) in February of 2014. One might think that this would slow her down, undermine her ability a bit. It hasn’t. Allison is smart and determined. Illness might mess with her schedule but she uses her down time to create. She challenges herself constantly, attempts to keep a good work / life balance, and uses her experience to infuse her art with feeling. I believe she’s succeeding beautifully.